In the world of coaching and self help, you will come across the term ‘personal power’ quite a lot! I use it a lot as well so I wanted to write a bit today about what it actually means! 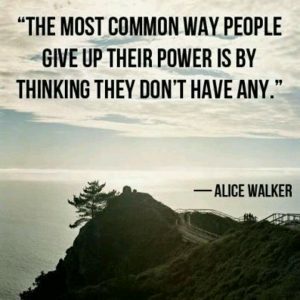 What does personal power mean? To be honest, it will be different for each person but how I define personal power is ‘your ability to take action’. For me, my ability to take action and follow through equates to how powerful I feel within myself. We all have those times when we feel stuck, uncertain, indecisive, overwhelmed, anxious- all of those negative emotions that come into play in our lives. Often they have a lot in common and that is that you’re more in your head and not in action. The most powerful way to shape our lives is by taking action- it’s not by talking about it, thinking about it or dreaming about it, it’s by going for it. Every action we take is a cause set in motion and it builds on our previous actions to move us in a particular direction. When we’re moving in a particular direction, eventually we will arrive at our destination. That destination then depends on you- have you been moving towards what you want or have you been moving towards what you don’t want. Every action is a cause set in motion (as is every inaction) but it’s what we do on a consistent basis that brings us to our destination. So for example, if I haven’t been taking action and have sat on the couch night after night, my destination will be that my jeans are tighter and that my energy is low. If I’ve been saying yes to extra demands on my time in work, my destination may be resentment and burn out. If I’ve been taking action and going out running on a consistent basis, my destination could be a personal best time and a sense of pride and achievement. So, what comes before action? The answer is decisions. You have, whether you like it or not, have been making decisions and choosing your path in life. Everything that happened in your life, whether your thrilled about it or bummed about it, began with you making a choice and making a decision. The decisions that you’re making today will shape your life for the weeks and years to come… where will you be in ten years time based on the decisions you’re making today? It’s something to ponder…. Is it our life circumstances.. or our decisions? Now, I’ll admit, I didn’t want to believe this to be true but the more I worked with different people the more evidence I gained that it’s our decisions rather than our life circumstances which impact our direction in life most powerfully. We all know people who have had a really rough time, that were dealt a pretty bad hand in life yet, they have turned their lives into something amazing! And, we all know people who had every advantage that was possible to have yet they’ve always been miserable. It’s our decisions that make the difference, not our conditions. The really interesting thing is though that the majority of my clients don’t trust themselves enough to make big decisions anymore. A main reason being is that they’re focused on the circumstances- perhaps you chose to study accountancy in college, graduated and went to work as an accountant- and hated it! You have an idea of what you’d like to do instead but you don’t make the decision because you don’t trust that it will work out. You tell yourself, I’m the one who chose to do the accountancy so obviously I can’t be trusted to make decisions on my life. I see this over and over again and you’re missing the point. You were the one who made a decision, invoked your personal power and brought yourself there; you are the only one who can get you out of there as well by making a different decision! This is personal power and the majority of us are choosing not to exercise it. There are no failures in life, only results. If the first thing didn’t work out, try something else. If that doesn’t work, try something else, if that doesn’t work, try something else. What could your life look life if you invoked your personal power? What new decision would you make? I’d love to hear your comments and feedback! Do you have big dreams for yourself but keep getting in your own way? If your answer is yes then the ‘How To Play Big when You Feel Small‘ is for YOU! Join me on Wednesday the 7th September at 6.15pm for this FREE 60 minute Master Class and dive deep into this topic with me. This entry was posted in Progress and tagged afriad of making a decision, life coach dublin, personal power, what if I'm wrong, women on August 24, 2016 by admin.